i connect PC2 to DIR-895L via Gigabit Ethernet, and PC1 connect DIR-895L via DWA192, copy file 880 MB speed ~20 MB/s. please someone here that use 895L can share your real throughput copy file via wireless AC from router or other pc that connected gigabit cable to your PC, what is your speed? maybe i need to change my firmware, setting etc? or i have defect unit? Wired should be always faster than wireless. Wireless will not be as fast as wired GB. The two speeds I saw between my 890L and the non-D-Link routers indicate that there maybe an issie with the router wifi drivers. I presume D--Link support should be made aware of this issue so they can check it out as well. Maybe they can help on this. Theres a new build of FW on the 890L that seems to have resolved some issues. I need to load it up and re-test with the DWA-192. Not everyone may have a DEA-192 to test with so results may differ with other Mfr wifi devices. I recommend that you phone contact your regional D-Link support office and ask for help and information regarding this. Reference this forum thread as well. We find that phone contact has better immediate results over using email. Quote : ""I started my evaluation of the Killer Wireless-AC 1535 by performing a simple file transfer test, and my file copied over the network to the connected MSI Dominator Pro G notebook with impressive speed. 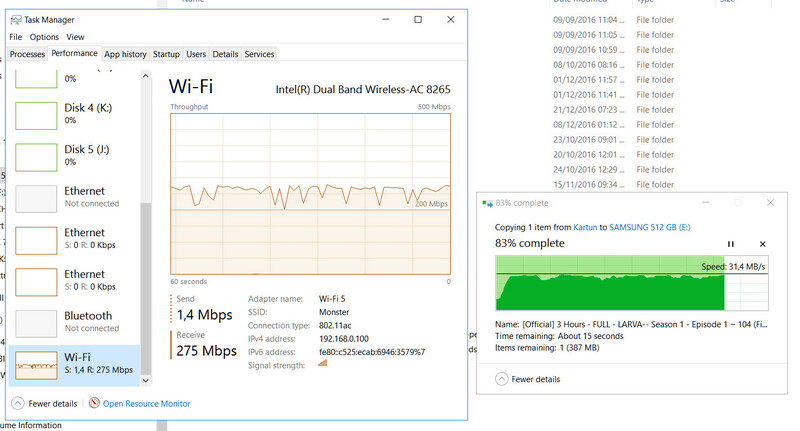 The transfer topped out at nearly 80 MB/s, which was about the upstream limit of my PC server's rather weak onboard NIC, and I was seeing nearly 700 Mbps (of the theoretical 867 Mbps connection) from this 2x2 adapter connected to the Linksys MU-MIMO router""
Which MSI ?laptop? are you using exactly? I had some issues with my wireless WT60... the upload was screwed up big time... I found some fix online. My WS60's didn't have the problem. Kind of hard to compare this Killer adapter with the DWA-192 and a Linksys router. Uses different drivers. One would need to test the Linksys with DWA-192 and Killer with the 895L to see. The Killer adapter appears to connect at 867Mb where the 192 supports 1300Mb, however the Killer adapter support MU_MMO where the 192 doesn't. I presume the MU-MiMO on the Killer and Linksys router is where the speed is seen. So I figured I'd try the 192 on my Mac Mini that I recently updated to Sierra 10.12.1. I had also connected my good ol DIR-868L v1.12 FW up as the main host router to help another user out with some testing. I loaded the 192s Mac drivers and got it connected and figure that since it connected well, lets try some xfers from my NAS. Connection rate reported by the 868L wireless menu said 600Mb at 100% signal. Not sure how accurate that is since the drivers on this router are a bit older. Both speeds were not constant however achieved these speeds and hung around or near during the read from the NAS. Well, at least with the 868L, looks like the 192 can achieve higher than 15-20Mb. I have new FW for my 890L and it's been loaded. Soon has I get some time I'll retest the 192 and the 890L out. I loaded a v1.10 b7 Beta FW for my 890L and did a Read file copy from my NAS. 192 is still hitting 70Mb. Speed isn't constant however fluctuates around 40-60Mb. Good speed for a 4Gb file. I'll re-test with Windows 7 again. I don't have the 895L so I can't test it to be sure however I can only presume that the drivers on the 895L and the 890L are same code base, however do differ since the 895L is geared differently in regards to the speeds and MU-MIMO. This maybe a factor. Also the drivers on the 895L may have similar problems as reported on the 890L. Which now seems fixed. I recommend that you phone contact your regional D-Link support office and ask for help and information regarding this. Reference this forum thread. We find that phone contact has better immediate results over using email. WAN speed problem: Lets trouble shoot this one. Your the first who's reported that WAN speed testing is slow. We need to narrow this down more to figure out if this is a router problem or something else, i.e. ISP service, ISP modem or cabling. Nobody else has reported problems on the WAN side so we can't say it's a bug at this time. Please start an new thread regarding this WAN speed that your seeing. Are you having problems with the WAN side? I would say there is some speed differences seen between Windows and Mac OSX. The DWA-192 remains connected with the DIR-890L. I am seeing a problem with this same adapter and a non D-Link router and it not remaining connected with Windows 10. I'll give this a try. Thanks for posting this info. I'll give this tweek a try and retest with my NAS and the 192. It kind of makes sense that Windows maybe playing a part in the slow down as when I tested with Mac OSX Sierra, I saw ~70Mb when the 192 was connected there with my 890L.